The collection Time Out of Rodolpho Dordoni is a completes collection for the exterior (tables, chairs, armchairs, long chairs) that proposes a true modernity and breaks with the trains common habitually associated with the garden furniture. The contemporanity, the usage of current materials in again contexts, as well as a research of unusual definite solutions guided the conception of this collection. 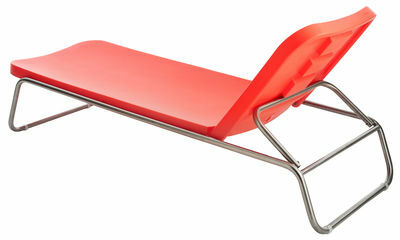 One loves this deckchair with adjustable back to rest in the garden or around the swimming pool. The sat is in colored polythylene, white, sand, blue sky or orange. The structure is in brushed steel. She also is very appreciated for the installation of the groups.